The Crawley Fleadh, is a celebration of traditional Irish culture taking place during March 2012 in and around Crawley, West Sussex.The event is organised by the Celtic and Irish Cultural Society with financial support from the Irish Government’s Department of Foreign Affairs; Emigrant Support Programme. The Crawley Fleadh pronounced flah – is a festival of varied traditional and modern events in celebration of Irish culture through a variety of different art forms and activities. 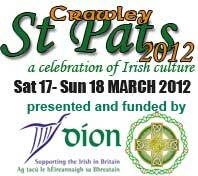 The 2012 Crawley Fleadh features varied activities including music, comedy, dance, film, sport and story telling . The Fleadh now forms an annual Irish celebration as part of Crawley’s cultural calendar together with the Saint Patrick’s Celebrations. The Fleadh brings things to students and the public of an Irish nature including qualified Irish sports (GAA) coaches into primary and secondary schools. Back in 2007, for the first time in Crawley’s history primary school children got the opportunity to play hurling and, in 2006, we introduced secondary school children to Gaelic Games. For a full list of events, click on our events tab. Crawley Fleadh events are no longer listed on this site. Please visit our main site for upcoming events. Due to website update changes, previous events are no longer to view. The CICS apologise for the inconvenience. 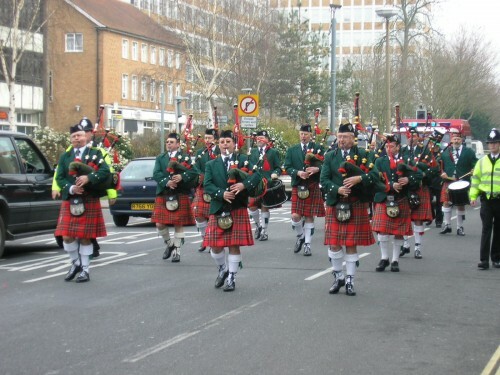 The Crawley Fleadh and Saint Patrick's Parade is organised by the Celtic and Irish Cultural Society with support from local funding and community sponsors. Crawley Fleadh 2012 © Celtic and Irish Cultural Society. All Rights Reserved.